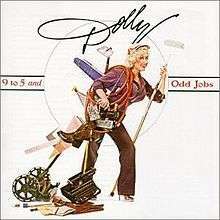 9 to 5 and Odd Jobs is the 23rd solo studio album by Dolly Parton, and was released in late 1980. A concept album about working, the album was centered on Parton's hit "9 to 5", which served as the theme song to the film of the same name (co-starring Parton, Jane Fonda and Lily Tomlin), and topped both the U.S. country and pop charts. The album's two additional singles—a cover of Mike Settle's "But You Know I Love You" and a reading of "The House of the Rising Sun" – provided further country hits, with "But You Know I Love You" also reaching #1. The understated pop-country arrangement of most of the songs was seen as a welcome return to form for Parton by critics, after the overly-polished pop sound of Parton's previous albums. In addition to five Parton compositions, the album contained a number of folk and country classics, including work by Woody Guthrie, Mel Tillis and Merle Travis. The album was produced by Mike Post (with the exception of "9 to 5", which was produced by Parton's bandleader Gregg Perry). A 1983 reissue on cassette omitted the tracks "Detroit City" and "Dark as a Dungeon," and moved the song "Sing For The Common Man" to the end of Side 2. However, a 2009 reissue of the album included all ten of the album's original tracks, as well as a remixed version of "9 to 5", and a previously unreleased cover of Sly & the Family Stone's 1969 hit "Everyday People" as bonus cuts. The album stayed at No. 1 on the Billboard Top Country Albums chart for 10 consecutive weeks and ended up being certified Gold by the Recording Industry Association of America. The album is now out of print. Allmusic rated 9 to 5 and Odd Jobs four-and-a-half out of five stars. William Ruhlmann, who reviewed the album, stated that due to RCA's practice of "shoving poorly organized products onto the market, most of Parton's albums are hard to recommend", but that "[the songs are] enough to put it a notch above most of Parton's RCA catalog." Critic Robert Christgau rated the album a B+, stating that how one would respond to the album "depends on [his/her] tolerance for fame-game schlock", although he also said that "I'd never claim Johnny Carson's damaged [Parton's] pipes or her brains". 1 2 "Robert Christgau: CG: Artist 372". robertchristgau.com. Archived from the original on June 6, 2011. Retrieved June 20, 2011. ↑ "RPM Country Albums for March 7, 1981". RPM. Retrieved June 30, 2011. ↑ "RPM Top Albums for April 4, 1981". RPM. Retrieved June 30, 2011.